NordicTrack is a Minnesota established company that started off by first creating indoor cross-country ski machines. They later went on to expand their designs, during 1980’s, towards treadmills, elliptical machines and other cardio related in-house trainers.Currently, Nordic Track is known to be a top international brand under the ownership of ICON health and fitness. Nordic Track brings its customers traditional treadmills, incline trainer treadmills and treadmill desks, with each series having separate models of its own and various resources such as touchscreens installed with android. Treadmills are a very integral part for those who are enthusiastic about staying in shape, working on their cardio or who prefer to stay indoors, in the safety of their homes, and enjoy working out. It boosts your stamina and makes you more energetic. NordicTrack, with its variety of fashionable treadmill consoles, gives easy access to every one looking forward to an enjoyable workout experience. Kicking off with one of NordicTrack’s cheaper models. The T 6.5S is equipped with a folding frame which falls under the “Space Saver”design by this brand. This treadmill gives out a 2.6 Continuous Horsepower and has a 300 pounds (136 KG) weight capacity. The treadmill will also be able to reach a 10% incline and a top speed of 10 mph (16 Km/h), giving you the autonomy of choosing to either walk, jog or run. Besides that, with a 20 inches wide and 55 inches long belt area, the T 6.5S also comes with FlexSelect Cushioning which helps in reducing stress on your joints (knees and ankles), a 5 inch back lit LED, which helps you in tracking your workout progress, the level of incline, elapsed time, calories burned so far and the distance covered. It also has two cup holders. Although the T 6.5S has 20 pre-installed workout programs, you can get an iFIT subscription and get access to more workouts using this iFIT compatible treadmill. With heart rate monitoring sensors you can keep track of your heart rate throughout your workout routine and to aid to your motivation and concentration,The machine comes with MP3/iPod fitted port and two speakers to keep you pumped up. NordicTrack gives you a staggering deal with a lifetime warranty on the frame, 25 years on the motor and 1 year each on parts and labor. All in all this treadmill is a “you get what you pay for” model which brings you few featured offered in high end models by this brand. This product offers you simple actions and tasks you switch between with ease. It is designed for beginners looking for uncomplicated functionalities and maintenance. If you’re looking for a workout machine that brings you up to the minute technology, the C-700 is your haven. Conclusively, it can be confidently said that the C-700 is best for beginners looking forward to machines that offer a few high end features. The specs on this console do not meet high expectations, it has mid-range potential which mainly attract walkers. For some users it offers a decent deal considering it’s rather more entertain than it is athletic. The NordicTrack C-990 is designed to bring its customers the option of walking, jogging and light running. The machine is equipped with a 3.0 Horsepower motor, a tablet/smart phone holder, where you can set up your personal routine to follow using other fitness applications or videos, an iPod compatible port, InterMix Acoustics speaker and a 7 inch back lit touch screen accompanied with internet access and a digital race track that brings you a virtual progress experience. The running belt is 20 inches long and 60 inches wide. It offers customers 32 pre-installed workout programs, for those who prefer to work offline, that are grouped with specific targets to be reached such as, weight loss, interval training, speed training,calorie burn, etc. This model comes with iFit technology that makes it easier for the user to track their workout data and have access to a library of infinite amount to workouts they can follow. To make the experience more enjoyable for you, the machine has a web browser and an iPod friendly sound system through which you can listen to your preferred music. This model has a whopping top speed of 12 Mph (19 Km/h) and a 12% incline limit. With access to the internet through the C-990 you can challenge yourself online by working out with friends over Facebook or even creating routines best suited to you. C-990 also has an AutoBreeze cooling fan that automatically adjusts according to your working out and FlexSelect cushioning which can be switched on or off based on your preference of indoor or outdoor track. The SpaceSaver design gives it a foldable frame that helps you save up space in the room. Finally, we can agree that the C-990 offers a decent amount of features in its price bracket. Although, it’s still not the best option for runner, as it offers basic facilities. The added tablet holder makes it an entertainment hub for the users. It is still a more than well-equipped machine for those who want a good workout indoors. The top contender in NordicTrack’s C series, the C-1650, aids its customers with great functionalities. This treadmill has a 3.5 Continuous Horsepower motor, which can hit a 12 Mph top speed (19 Km/h), and a 20 inch wide and 60 inch long running belt, making is very spacious. This model particularly stands out due to the 10 inch touch screen it comes with. The touchscreen is web enabled and is powered by android. The screen helps you in checking your progress, web surfing and serves as an interactive user interface. It has 34 pre-installed programs created by a certified trainer that brings you specific targets to reach in different categories like, weight loss, speed training, interval training, calorie burn, etc. Additionally, because it is iFit enabled, it makes tracking your workout data easier and supplies an endless range of workouts. With iFit you can make routines that are best suited to you and challenge yourself by racing against your friends over Facebook. This model also has an iPod friendly port and speakers to make your exercise more enjoyable and help your stay concentrated. An adjustable tablet holder is available to use various applications for athletic or entertainment purposes. This treadmill gives its users access to 2 different heartrate tracking methods, either by using the handlebar sensors or by wireless Bluetooth sensors. Moreover, it has an Auto Breeze cooling fan which adjusts according to your workout and a FlexSelect cushioning on the generously long track which can be switched on, to reduce the impact on your joints, or switched off, if you want realistic road-like touch to be added to your exercise. Equipped with a Space Saver design it takes up less room after folding the deck upwards. The C-1650 comes with a lifetime warranty on the frame and the motor, a 5 year warranty on parts and electronics and a 2 labor warranty. Arguably, this is one of NordicTrack’s stronger models. With a longer and durable track, a more powerful 3.5 CHP motor,iFit features, and a quiet and smooth functionality, it can start delivering satisfying results to walkers and joggers. The additional speakers, touchscreen and tablet holder makes the workout experience rather entertaining for the customers. The C-1650 is like Christmas in summer for those who prefer light exercises. 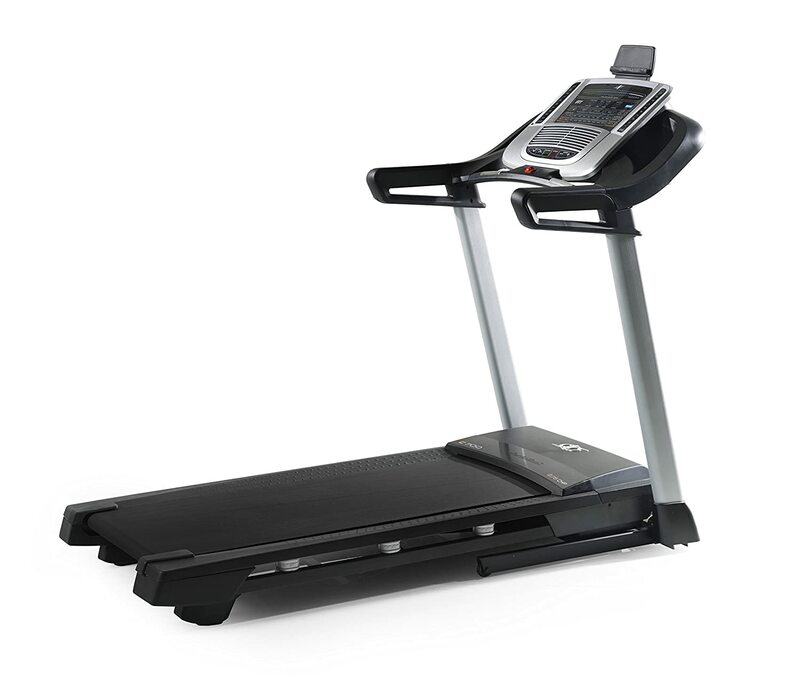 Jumping to NordicTrack’s commercial series, we first introduce the commercial 2450 treadmill. This machine is equipped with a stronger motor, heavy structure and a tougher build. Commercial 2450 is designed for those who want a pure running experience. The 2450 successfully mixed power with advanced technology. The machine has a powerful 4.0 horsepower motor with a 22 inch wide and 60 inch longtwo-ply running belt, giving you more room to move freely. A new addition to the treadmill functionality by NordicTrack, which wasn’t available in any of machines seen before, is the option to decline the machine during your workout, you can bring the ramp down to a -3% decline. The 10 inch touch screen gives you access to the internet like never before, you can go online and go through latest news, watch videos, read mails or even use social media while you exercise. With iFit compatibility accompanying the treadmill, you can choose between various terrains to run from around the world, have a virtually realistic experience, track your workout, make diet plans, and download several more workout routines online. Even if you choose not to have an iFit subscription, there are already 40 pre-installed workouts you can take advantage of. These workouts are goal oriented like calorie burn, speed training, interval training and are created by professionals. It has a top speed of 12 mph, making it an ideal product for several users who prefer to run. It is a great console for various forms of training like, sprinting and speed training. This model comes with a wireless heart rate monitor, which is preferred by several users because it makes the workout more efficient and gives out more accurate tracking data. 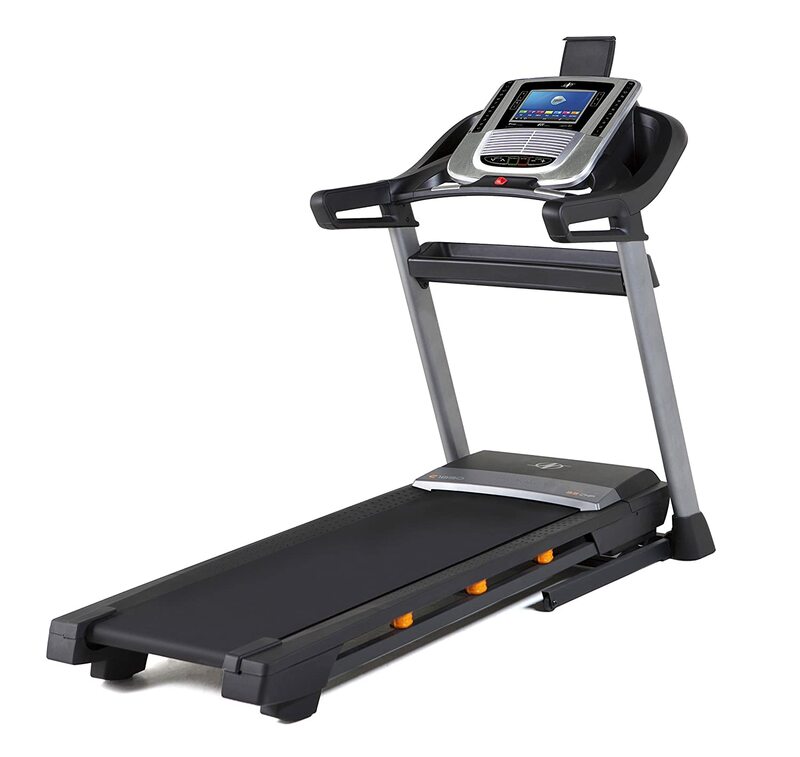 It also has adjustable FlexSelect cushioning and an adjustable tablet holder for the user to set it at any desired angle, like other NordicTrack treadmills. This is one of NordicTrack’s high end products thattargets regular runner’s customer base. If you want a smooth running experience with a flood of modern day features to make it enjoyable and worth the while, this machine is perfect for you. It is a peak value product with its state of the art facilities like, the 10-inch touchscreen, iFit, access to the internet, etc. Yet again, NordicTrack brings its customers what they need for a satisfied indoor workout. The 1750, despite being the cheapest model in the commercial series, has plenty to offer with its sleek design and HD touchscreen. An impressive warranty and new age technology brings us a must have for frequent runners. NordicTrack introduces its largest treadmill equipped touchscreen with the Commercial 2950. The treadmill has a 22 inch touchscreen, with color display, that supports high definition videos and with access to the internet you can use several other functions, like surfing the web, going through the news and installing more workout content. A powerful motor of 4.25 Horsepower accompanies the treadmill which offers a top speed of 12 Mph. Again, with a spacious design of 22 inch width and 60 inch length two-ply running belt, that gives you a comfort and ease when working out. The deck also has WhisperQuite technology, which is said to soundproof the machine. This machine also has a Runners Flex cushioning facility, which is to reduce stress on joints by 30%, and can be switched off on command of the user. AutoBreeze fans offer control in temperature and can automatically adjust according to the intensity of your workout. It has an access tray and a tablet holder for the users. The 2950 comes with a one year subscription to iFit Coach plus where you can choose your everyday exercises from an endless library.However, the treadmill also has 40 pre-installed programs to assistuser’s workout if they choose to not continue theiriFit subscription after a year. Due to SpaceSaver technology, the machine can be folded after the workout. If you feel the need to make your exercises more intense, the machine also has incline (15%) and decline (-3%) operations that help you practice particular muscles and burn more calories. This time around NordicTrack brought something different to its customers. The 2950 comes with arm-candy. A wearable iFit wrist device to aid you in tracking your steps, calorie intake and other functions to keep you healthy. Making the user’s workout routine more efficient than ever. There is a lifetime warranty for the frame, deck and motor. Alongside, a 5 year warranty for parts and electronics and 2 year labor warranty is also provided. The 2950 is without a doubt is a heavy duty in house exercise machinery. It offers durability with its components.With its ability to adjust heights and endure a 300 pound weight limit, it becomes a family friendly machine as well as a good option for regular runners but the price bracket the 2950 lies in makes it a reasonable purchase in higher end home gyms only. This machine is built for serious walkers. 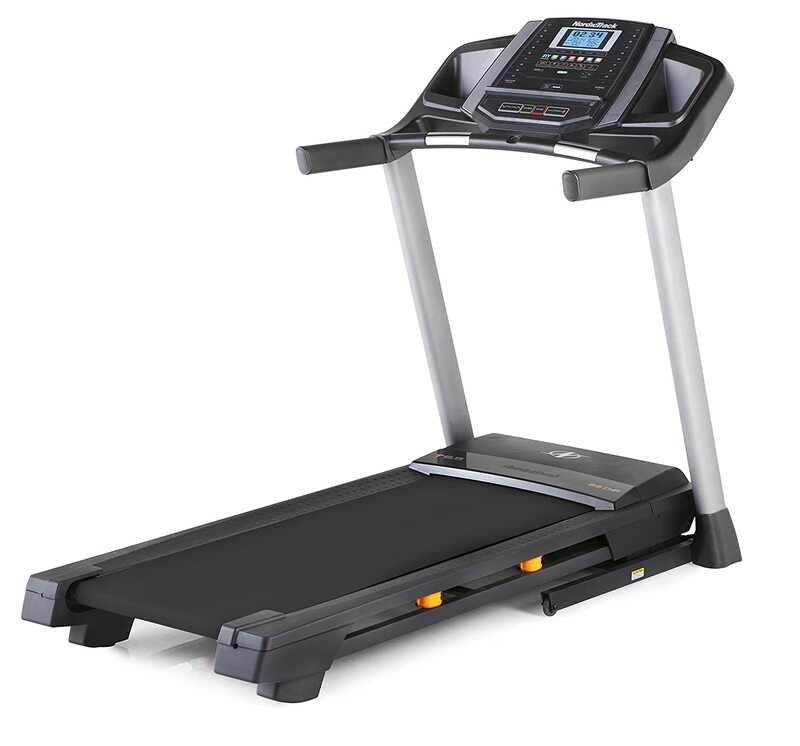 It is energy and time efficient and carries most specs found in only high end treadmills in the market. With ample workout programs, the X9i serves all your intense workout needs, so if you’re a user looking for fast results and regular challenging task to improve your body, there’s no better way to go than the X9i. An upgrade from the X9i is the NordicTrack X11i. X11i is also an incline trainer that has a lot to offer to its users. Similar to the X9i, the X11i has a -6% decline and 40% incline limit, making it one of the most effective fitness equipment as it lets you burn calories five times as faster than usual treadmills. However, with this model you get a more powerful motor with a 4.25 horsepower which brings you a top speed of 12mph and performs all tasks quietly. The machine supports weight of up to 350 pounds making it very durable. The X11i flaunts its 10 inch touchscreen display which access to the internet. The running belt is very generous with 22 inches in width and 60 inches in length, 2 inches wider than most traditional treadmills present out there. Just like all of NordicTrack treadmills, this one also has an iPod friendly port and speakers to help you stay motivated during your workouts and make it an enjoyable experience. Besides using the handle bar heart rate monitoring sensors to track your heartrate, you can use chest strap that comes as a complimentary good with the machines when purchased, for wireless monitoring of heart rate via Bluetooth during workout. This model has 2 cooling fans to help you regulate your body’s temperature by automatically adjusting to your exercise intensity. The highlight of this product is its range of variation with the ramp. The variations target specific muscles in your body so you can focus on toning them. You can use iFit’s abundant library of workouts present online. The iFit also gives you the option to train on various landscapes. Or you can make use of the offline 44 pre-installed programs that come with the machine. The pre-installed programs are goal oriented. It also has a tablet holder through which you can access outsider workout apps if you prefer. NordicTrack has been very generous with the warranty on this product. You get a lifetime warranty on the frame, deck and motor, a six year warranty on parts and electronic components and 3 years of warranty on labor services. The reality TV show “The Biggest Loser” claimed that this machine is the fastest way to lose weight.If you want to step up your game, while working out indoors, the X11i will provide you with more than sufficient facilities to do soas it is built to give you fast results. 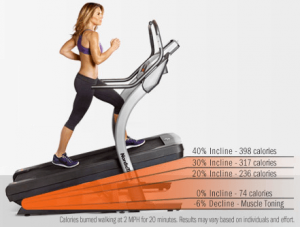 A report said that users were able to burn 400 calories in just 20 minutes at the speed of 2 mph only.It is an improved version of the X9i, while both are incline trainers, the X11i has a more powerful motor, a more interactive user interface, 10 inch touchscreen, internet access and speakers for entertainment. The only downside to this product is itshigh price bracket where the X9i has an upper hand. All work and no play is no fun. You’ll sometimes make exceptions on your exercise routines when it comes down to doing work related tasks. This product is best suited for both offices and homes when you want to mix your leisure time with your work. Due to its foldable feature you don’t require large spaces to use this and the motor doesn’t come as a distraction with the product. Besides multitasking it can serve as a typical treadmill in your homes too but it isn’t as sturdy as other treadmills in the similar price range. If you really love multi-tasking and can’t take your mind/eyes off your computer screen then you will fall in love with the Desk Platinum treadmill. It has a firm 40 inch wide desktop you can resort to. A silent 3.0 Horsepower motor which means you can perform important tasks, like taking a phone call, without the hesitation of interruptions or distractions. It is iFit enabled which means you have access to an infinite amount of exercises. Besides doing your work on your computer, you can use the iFit application and launch an interactive interface to choose a terrain anywhere in the world while you are on the treadmill or do any other task while working out. 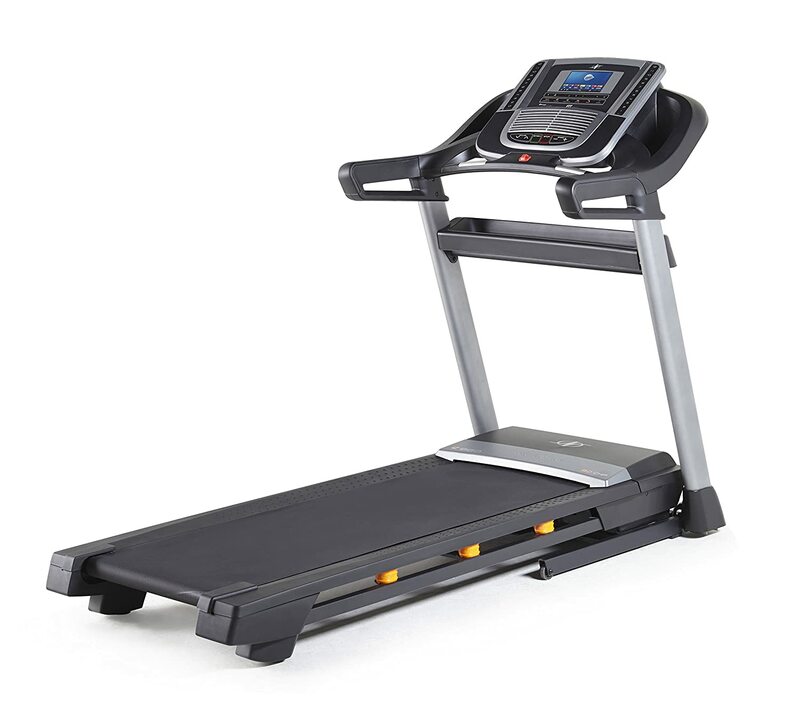 This treadmill can specifically be beneficial to runners due to the 3.0 continuous horsepower motor and a 60 inch long track that’s usually found in treadmills made for runners. The cushioned track also makes it a very comfortable device. You can also incline the treadmill up to 10% like other traditional treadmills to target specific muscles and speed up your calorie burning. It has a large work area, 40 inches in width and 18 inches in depth, which means you can perform other functions or have more objects on your desktop without the fear of creating a clustered space. You can also adjust the height of your desktop through a touch of a button unlike the NordicTrack Treadmill Desk where you had to manually adjust the desktop’s height. The adjustable desktop can also serve as a normal office desk after you are done working out. The spacious running belt and 3.0 HP motor also gets you to a top speed of 8 mph. The Desk Platinum is also equipped with a USB charging port for your electrical devices and due to its foldable functionality, you can save space in the room. With the Desk Platinum, you no longer have to give up your workout routine for work. You can take care of projects, paper work and presentation while staying in amazing shape. Besides using it at work you can use it like a normal treadmill machine at home and with features like iFit compatibility it makes a perfect In house machine to work out on while reading a book or even watching a movie. 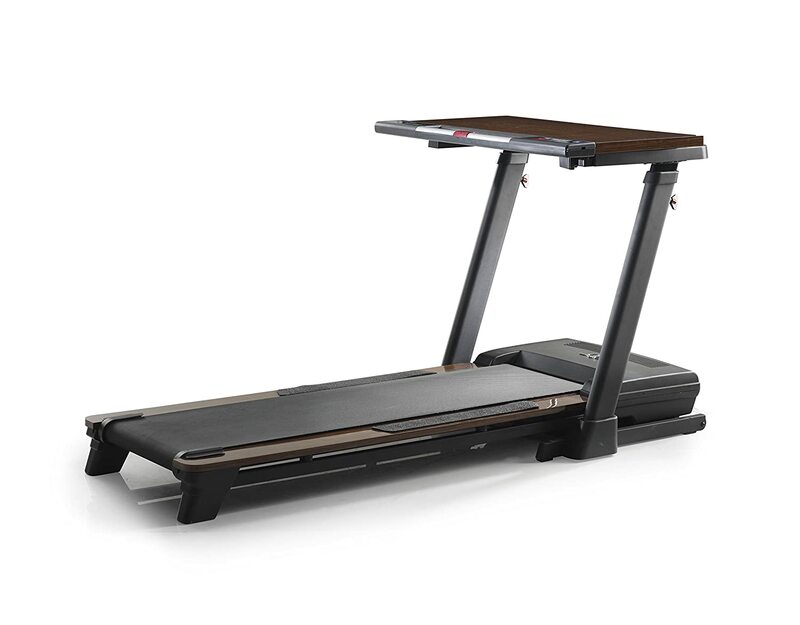 With an 8 mph top speed you can choose to run on the treadmill which isn’t possible on the NordicTrack treadmill desk. However, if you’re looking some light-weight walking or less of a challenge, you should consider the Treadmill desk.